ACA HTML to Image Converter converts the web page to image or thumbnail of a specified size in batch, saves the long web page as JPG, GIF, PNG, BMP, TIFF, WMF and EMF image by one click. You can adjust the image folder and file name settings in the Output options dialog by clicking Options in the Tools menu, and then clicking Output tab. Folder location, where the output images will be stored. You can click the Browse button to choose another folder. If you checked this option, the save folder will be opened automatically after complete the HTML converting. Name file with URL full path. Example: www.acasystems.com.jpg. Name file with increased number. Example: 1.jpg. Name file with timestamp. Example: 1236268243.jpg. Name file with hexadecimal timestamp. Example: 49aff4eb.jpg. If checked, ACA HTML to Image Converter will overwrite the existing image file if file already exist. 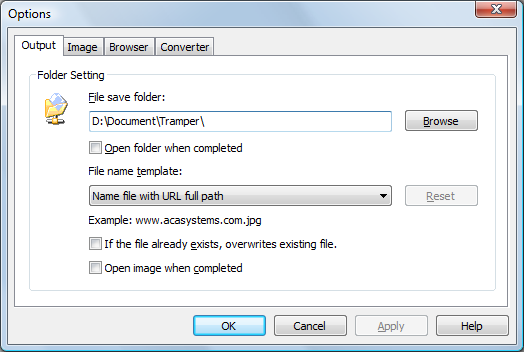 If checked, ACA HTML to Image Converter will automatically open the image in default image viewer after the converting task done.